My main transceiver is an Icom IC-7000, doing 2-100W on HF/50, 50W on 2m and 35W on 70cm. I use it mostly at home and sometimes when on vacation with our caravan. 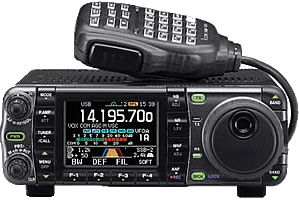 I purchased the IC-7000 because of it's versatility and nice display, after reading many reviews, tests and forumpostings about it. If you can have only one transceiver that does about everything from 80m to 70cm except D-Star, this is a good candidate. It is not the best transceiver you can buy, but a real good jack of all trades. And it comes in a very portable size too! In my car I use a Polmar DB-50 VHF/UHF dual transceiver. 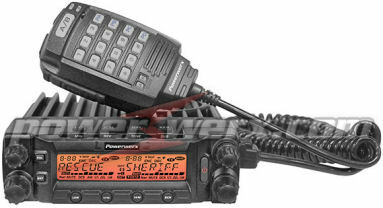 It is a clone of the Powerwerx DB-750X, which is a clone of the Anytone AT-5888UV. :) Why this clone and not the original chinese TRX? Well, I like the looks better. It does TX in narrow/wide FM on 136-174 (50W) and 400-490 MHz (40W) and RX-only on 108-136Mhz (in FM and AM). It has 2.5kHz channel step, so it will TX on almost any frequency needed. When I need to go portable, I use the Kenwood TH-F7E transceiver. It does 50mw/500mW/5W on VHF/UHF only, but has been MARS modded so also does TX on PMR446. It also has a general coverage receiver. 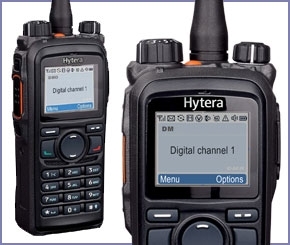 I use my Hytera PD-785G for working digital on DMR repeaters and/or simplex. It has 1024 channels, 64 zones (of 16 channels each), does 1 or 4 Watts on 400-470MHz and also has a GPS to send my position to aprs.fi.